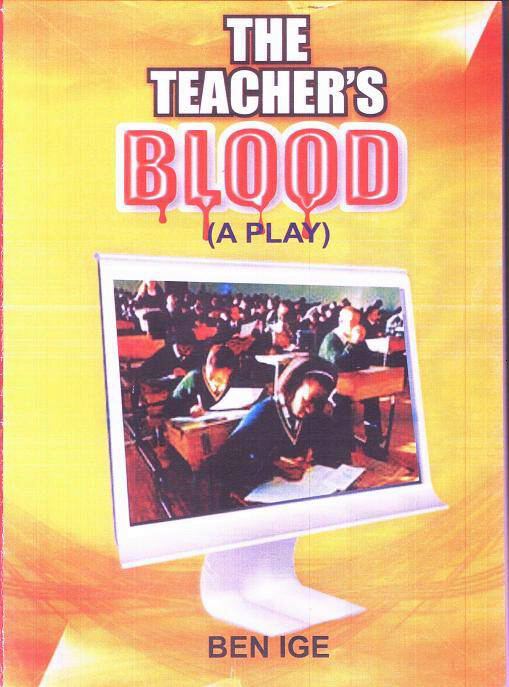 The Teacher’s Blood is a play centered on examination malpractice in schools. The play starts out with the glaring evil of students in an examination hall with corrupt invigilators, a metaphorical representation of our modern day ‘miracle centres’. As a result of a visit by some external supervisors, the invigilators hustle the students to do away with all the materials they have given them to ‘help’ them pass the exam. However, a challenge comes from one of the supervisors, which causes one of the invigilators to reflect on the error of his ways and turn a new leaf. This teacher resigns from his old school. He joins a new school where he does all that is in his power to discourage the students from engaging in examination malpractice. This is not received well by some of the students and their parents. Because the principal is threatened by the parents’ intended action to withdraw their children, she fires the teacher who just wants to do what is right. Meanwhile, a student of the university is also hoping to rope a Professor into committing this same crime of examination malpractice. This girl has gone through school constantly manipulating her way with her father’s money. She needs to repeat the process if she will graduate. The teacher in his fight to save the country from this pervasive evil of examination malpractice manages to get in touch with an Honourable. He passionately convinces the Honourable to pass a bill that will make university entrance examinations a one-to-one interview process, rather than the general written exam. This way, there can be no cheating involved. He pays the price for this bill with his blood; he kills himself in order to make the Honourable see how important his cause is. This sets the pace for an interesting chain of events in the play. The play ends with a monologue from the professor where he further charges the audience to join in the fight against examination malpractice. He states boldly that it is truly a battle because opposition will be fierce, but we should not be afraid to fight. In whatever category we all fall into, whether teacher, student, parent, government, or examination body, we all have a role to play and we must join hands to salvage the future of our children from the attendant evils of examination malpractice. The play highlights the role of each member of the society in the festering evil of examination malpractice. Parents buy success for their children, students are too lazy to read so they can pass, teachers and school management buttress their salaries with bribes, and the government turns a blind eye to this endemic problem. Each party in the society carries the responsibility of the damage that this terrible ill has caused in the education sector in Nigeria. Thus, it is the duty of every individual to remedy the situation and allow the change we need to begin from individuals rather than waiting for the government to effect the much needed change. The teacher who gives his life for the cause brings to light how vital it is that we take this problem seriously. His method, though extreme, is a symbolic representation of the lives that will be destroyed if examination malpractice is left to grow. His sacrifice caused the Honourable and his family to rise up to fight his cause. The lesson comes through clearly that it is never too late to turn a new leaf. Furthermore, the responsibility to right the things we have wronged falls solely on us. The most important element of the story is the importance of laying the right foundation where our children are concerned. Children are educated in every aspect of their lives right from school. If we will have future leaders who are good and honest, and who can make our nation great, it is important that we instill the right values in them right from now. Examination malpractice is the closest form of corruption to them, according to the play, ‘it is the best place to start to make things right’. The play is short and passes its message across with boldness. It is suitable for the intended readership and will serve as a very good exercise for schools all around the country. It deserves to be showcased on a platform that will ensure that the message is heard by all who need to hear it.